Appraised for $638,000! 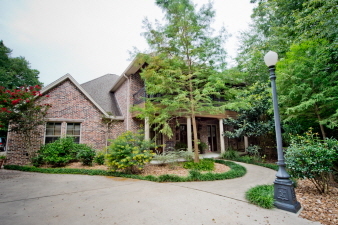 This beautiful New Orleans style home is nestled in the woods on 1.8 acres. Spacious custom built with quality, privacy & room to roam in mind. 5 bedrooms, 4 full spacious baths, 3 car attached garage with a huge 4 car carport, that also functions as an outdoor entertainment pavilion with a large brick fireplace! The front balcony sets this New Orleans inspired home off and invites your guest to cool off under 3 ceiling fans and enjoy a book and a glass of sweet tea. The balcony is finished out with tile floors and rich wood stained ceilings. If I were them, I wouldn't want to leave. Inside, brick arches and iron railing whisper New Orleans. The kitchen boast custom cabinets and rich granite tops , by the large breakfast and family style keeping room. The Den draws you in to retreat at the end of a long day. HUGE Master suite with a sumptuous tub and tile walk in shower. Huge Closet!!! Storage!! Large game room AND media!! Much more to see! !